Since I heared this song from Yuvvraaj, Can’t stop listening to it… Its been goin on a repeat mode on my ipod and the mesmerizing voice of Srinivaas flowing through the Copper Wires of my headphones and reaching my year… Starts off like a Hariharan Ghazal, but continued with lot of synth and guitars usage taking it away from a ghazal and dropping it off before reaching a slow melody number… I termed it “Ghazal on Synth!”. Loved the way one of the fellow bloggers reviewed this one… “Zindagi is one song that reminds you of everything in your life that you have carefully tried to forget . It is not easy to forget things and songs like Zindagi strongly reminds of the pathos in your life. With every passing note the song drills into your veins and you shudder softly as memories flow out tremendously . The magic of A.R.Rahman is clearly felt in this song.” You can read the complete review of the album here. 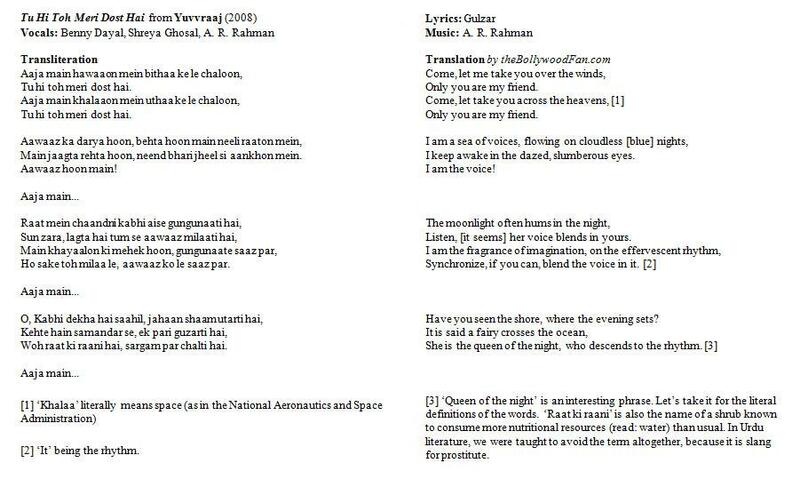 And It would have been difficult for me to understand the complete song if Waism from arrahmanfans.com would not have translated it so beautifully…. Here goes the translation. Zindagi Zindagi, kya kami reh gayi? Aankh ki kor mein, kyon nami reh gayi? You might have to use the zoom options on your browser to readthis without stressing your eyes! and now i am not… thanks to rahman and his yuvvraaj… since the time I got the CD, m on to it.. feel so relieved and fresh… m drowned in music.. the real musical that it is. my recomendations of tracks… tu meri dost, man mohini, zindagi, tu muskura, dil ka rishta … i am also liking mastam mastam.. i guess if u like the buddha bar stuff you should like it…. Aise mein koi kaise apne aansuon ko behne se roke? Aur kaise koi soch le everything’s gonna be okay? Aise mein koi kaise muskuraaye kaise hans de khush hoke? Hey, Aditi.. hans de, hans de, hans de, hans de, hans de.. Hans de tu zara..
Nahin to bas thoda, thoda, thoda, thoda, thoda.. Thoda muskura..
And my take on the movie… A cute n simple movie! Grabbed the copy of the maestro’s latest offering in the evening… and its 2:30 am here.. its being played continuously and i guess i might not sleep today as i can’t enough of it. My way of listening to a Rahman Album is, start with one song ( which is most likely to be the one sung by himself), and I did the same with Ada.. Meherbaan is the one on my mind rite now. Its the one which is playing for last 3 hours continuously. So probably I will post my opinions on this song and then will cover the other tracks in the coming posts. The song starts off with a piano ( close your eyes and you will see rahman on the piano while listening ) … piano some what sounds similar to the one heared in “Shauk Hai”, but a bit faster. Rahman has sung it so well, I get goose bumps when he sings “Tere bina mein hun be zameen, Tere bina mein be aaasman… Meherbaan” … and then starts humming ( oh breathtaking! )… with meherbaan in the background..
What a song! …. I am going for a repeat. It was drizzling in bangalore 2 hours back and was driving through the koramangala inner ring road at a speed of 15 kms… ( on the way to the airport to pick up a friend ) and Meherbaan in the background. Try it guys… you will fall in love all over again.. I Have always wondered, why in a Rahman album, the song sung by him goes around in my head for a longer time ( i get addicted ! ) , than any other song! … probably because I feel only he can justify his composition than any other singer. A bonus star for making me realise how beautiful love is…. thanks Rahman!